Detectives in Strand Road are appealing for witnesses following a robbery of a commercial premises on Foyle Road in Londonderry yesterday evening, Wednesday 27 December. 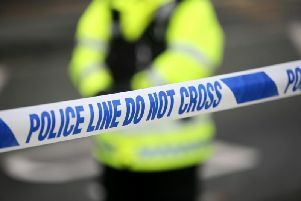 It was reported that at around 5pm a male entered the shop and threatened staff with a crutch. He attempted to take money from the cash register without success before making off with a charity box. The male was described as wearing a black baseball hat, a black zip up hooded top and grey tracksuit bottoms with a black stripe. Detectives are appealing for anyone who witnessed the incident or anyone with any information that can assist with the investigation to contact detectives at Strand Road on 101 quoting 1134 27/12/17. Alternatively, information can also be provided to the independent charity Crimestoppers on 0800 555 111 which is 100% anonymous and gives people the power to speak up and stop crime.